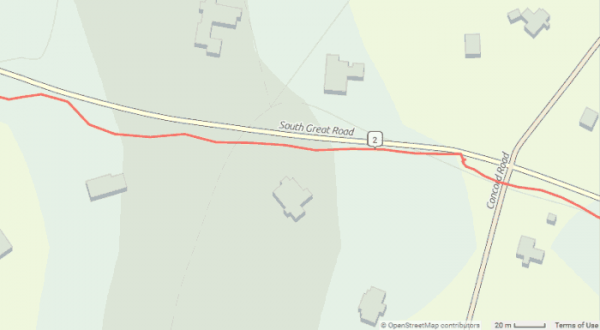 Raw GPS readings don’t quite follow the road. This entry was posted in New pages and tagged accuracy, altitude, Ascent, Avocet, Axiom, bicycle, Blackburn, Bontrager, Cannondale, Cateye, Ciclomaster, computer, cyclecomputer, Cyclomaster, Echowell, Garmin, GPS, kilometer, kilometers, km, measurement, mile, miles, MIO, Multito, Nashbar, Performance, Planet Bike, Polar, Pro, setting, Sheldon, Sheldon Brown, sheldonbrown, sheldonbrown.com, shimano, Sigma, Sunding, Trek, VDO, Vetta, XLC. Bookmark the permalink.